I'm a bit late with the newsletter this month. Time has just flown by and I have been busy with the site rebuild. I hope you get the chance to check it out and let me know what you think. 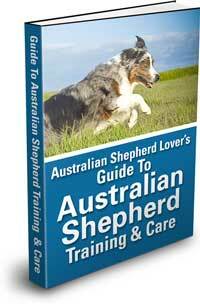 Want to Be a Writer for Australian-Shepherd-Lovers.com? Over the years many of our readers have become writers for the site. It's great to get a wider range of perspectives and experiences for everyone to enjoy. Do you have knowledge about a topic of interest to Aussie owners? Let me know more about your article idea and you could be published on your favorite Aussie site! The website rebuild is progressing slowly but surely. It's a lot of work but I think it's going to be worth it. Most of the main pages that link from the navigation bar in the left column have been converted. One new feature that I have been adding to the new pages is the Reader's Aussies photo in the right column. Keep an eye out for that. I've wanted to add more great photos to the site that have been sent in by our readers and this seemed like the perfect way. As you explore the site you can check out the photos as you go. Note: the image you see in the right column is just a small preview. Just click on it to see the enlarged version. Hope you like it! You'll also notice at the top of new pages and in a little bar on the left side of the window there are buttons so you can easily share pages on our site on Facebook, Twitter, Google +, Digg, StumbleUpon, Pintrest, etc. I'll Pick My Own Name, Thank You! This is a beautiful shot of "Tucker" from Tammy Pachura. Should You Get Pet Insurance for Your Aussie? Are you deciding whether or not pet health insurance is a good plan for you and your Aussie? The first step is to find out what the real cost and benefits would be so you can make an informed decision. You can follow the link below and get a quote from Embrace Pet Insurance. Whether you decide to go with pet insurance or start your own emergency fund it's something I recommend every Aussie owner (or any pet owner) have in place. >> Learn More About Embrace Pet Insurance << Please take a minute and get a quote!! "A dog owns nothing, yet is seldom dissatisfied." If you haven't joined yet I'd like to invite you to visit http://www.facebook.com/AustralianShepherdLovers.